I just signed up to this forum so I can keep up to date and discuss everything about my car with the aim of getting the most satisfaction out of it. I just got it last Friday. It's only lightly used and I've loved every moment I've had in it thus far. It's certainly an upgrade from my Peugeot 307. What I'm here to discuss is that when I connect my Android phone over bluetooth, the car's central console screen displays all the latin characters and the symbols in contacts perfectly, but all Greek letters come out as full-stops, e.g. '..........., .......... (.......)' . Why is that and what can I do to repair it? Thanks in advance to anyone who is willing to tackle this with me. You may do better if you can find a Greek forum - this is predominantly an UK forum & hence English/Latin characters so people with any experience of this are going to be very few or even nil. I wonder if the same happens with Cyrillic in which case a Russian etc. forum may be of more use to you than this one? How current is the system software? I am not sure how to check for that. Hello there. Thanks for the response. Unfortunately there is no "General>System Information" option in my menu. None of those lead to a General menu. The more I looked through the options available the more it looked hobbled. Maybe I'll have to ask the dealership what is up with that. Still open to advice and troubleshooting suggestions. Again, thanks for the interest and the effort. Can you post a picture of your complete head unit with the screen up? I wonder if you have a different unit from us - it's niggling at the back of my mind that in some previous post(s) Greece was different or omitted from Western Europe mapping? I take it that you are in Greece? Can you post a picture of your complete head unit﻿﻿ with the screen up? Greece﻿ was different or omitted from Western Europe mapping? It's a fairly basic set. It has no LCD screen or maps functionality, if that's what you meant. And yes, I am in Greece. Lastly, I contacted the Toyota dealership I got the car from (used). I submitted the same questions to a big Greek forum (#1 on Google search) and it was deleted with no explanation or way to contact the admins. Once again, thank you for taking an interest in this. Do you have a full manual for your car? 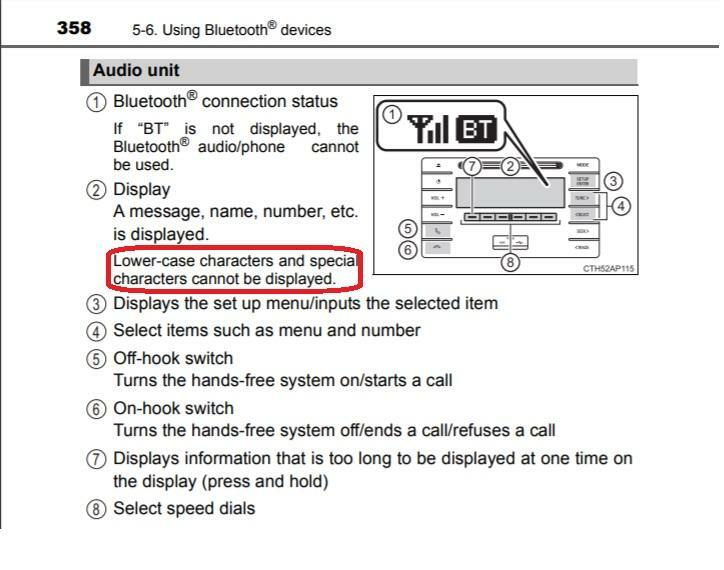 I had a look at the English version (a Greek version is also available for free download) & in it for bluetooth on that unit I noticed "Lower-case characters and special characters cannot be displayed." 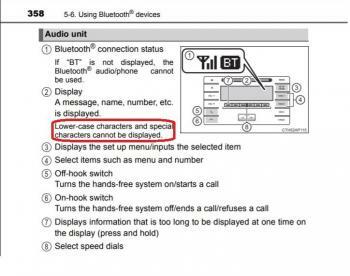 In English language setting Greek characters may well be classed as "special".